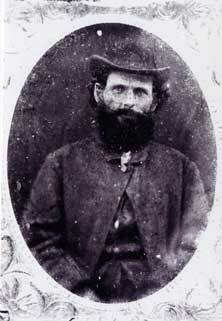 Andrew was born December 5, 1831 in Marion Co., AL to Virginia McCaleb and Robert Logan. He married Cathren Cothern on March 12, 1876. Children were: Rhoda, born November 25, 1876; Mary Jane, born September 27, 1878; Margaret Ann, born March 25, 1881; James Pickens, born March 15, 1883; Cathren Jane, born March 29, 1885; Fannie Bell, born January 22, 1887 and Andrew Lincoln, born January 22, 1891. Andrew's father was born 1840 in Stokes Co., NC and purchased land in Marion Co., AL sometime before 1860. During the Civil War, Andrew voluntarily enlisted in Company K, 1st Regiment Alabama Cavalry Union Army commanded by Col. George E. Spencer on 24 July 1862 in Huntsville, Alabama. On 12 August 1862, he was mustered into Captain David Smith's Company at Huntsville. From 1 November 1862 until January 1863, he was in Hospital #13 in Nashville, Tennessee with typhoid fever. After he was discharged from the hospital he was assigned on 1 February 1863 to Company E, 1st Regiment of Middle Tennessee Cavalry. He was captured at Rome, Georgia on 3 May 1863 and confined at Richmond, Virginia on 9 May 1863. He was paroled at City Point, Virginia on 15 May 1863 and reported to Camp Parole, MA on 18 May 1863. He was sent to C.C.O. on 19 May 1863 and then reassigned to Company K, 1st Alabama Cavalry on 9 June 1863 which was commanded by Col. Spencer. He was promoted to Sergeant 1 November 1863 by order of Col. Spencer and was on daily duty as commanding Sergeant of Company K until June of 1865. On 15 June 1865, Andrew entered Hospital #4 in Nashville, Tennessee with symptoms of malaria and mumps that he had contracted at Huntsville, Alabama. After being in the hospital 20 days, he was released upon request, since he was not fit for service, but desired to be mustered out with the Regiment in order to be assisted home by his comrades. Sgt. Andrew Logan was honorably discharged with the rank of Sergeant on 19 July 1865 at Nashville, Tennessee by reason of termination of the war. Picture submitted by Donna W. Collins.